He bowled a Total of 13 overs in this world cup for team India. He was belted to all parts of the ground and in the process he conceded 105 runs from these 13 overs that he bowled. The Bangladesh Tigers smashed him around the park for 53 runs in just 5 overs in the very first match of the world cup. In the finals the Indian captain took a big gamble by picking him in the final line-up and he was again smashed around the park. He conceded 52 runs in 8 overs. Why is he still in the Indian cricket team? A question to which none of us have an answer. Yet, he is indeed a lucky charm for the Indian cricket team. You would have now come to know who I am talking about. The black mark in the Bleed Blue Indian Team- Gopumon @ Sreesanth. Rs 1 Crore for those beautiful bowling figures? Sachin Tendulkar, Yuvi, Raina are also getting the same reward for their performances. You can definitely be not serious. Sreesanth was thrashed around the park. He has never learnt from his mistakes. His temperament is so weak. He even tried picking a fight with Mahela Jayawardane. That was a very bad sign because Mahela will be leading the Cochin team in the IPL. Sreesanth is a part of the Kochi team. I watched the finals along with my college friends in Park Hotel in Chennai. The atmosphere in the hotel was crazy. But everytime Sreesanth came on TV, everyone became furious. Foul words were thrown at him in unison. When Dhoni hit a six to win the world cup for India, we all jumped in joy. It was an euphoric feeling. Everyone in the hotel went on a hugging spree. It was a joy to watch the Indian team rushing inside the ground. When Yusuf Pathan carried Sachin on his shoulders, we had goosepimples. When Yuvaraj Singh had tears in his eyes, we could relate with his feelings. When the Little Master cried, we all cried along. But suddenly, out of no where, Sreesanth also started crying and the immediate response was a bunch of foul words. One guy in the hotel even tried to do a Ponting act by attempting to break the big TV screen. But we calmed him down. How can he even run the winning lap? How dare he? The world CUP lost its purity the moment Sreesanth's lips came in contact with the cup. How can he kiss the same cup that was kissed by Sachin? Why do 1 Billion people in the country get angry when Sreesanth appears on the screen? It is his childish attitude that comes to our mind. None of us have any personal qualms against Gopumon. As a person, he might be a wonderful personality. But what he is on the field definitely defines his role as a player in the Gentleman's game of Cricket. I was mellowing down as I was typing this post. But the reaction given by Sreesanth in the following picture makes me go bonkers again. How dare he? 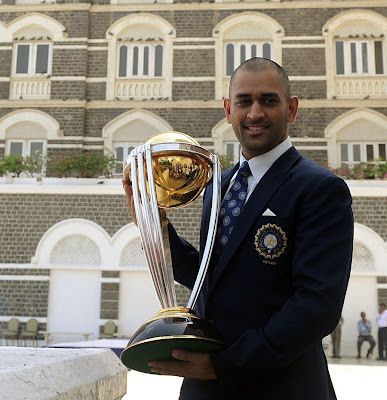 I can proudly say that Dhoni is the best captain India has ever produced. None of us can even fathom in our wildest thoughts on what runs in Dhoni's mind. But Our Mr. Cool Captain knows what he does and thats all we need. The following picture says it all. The jubilant mood of the Indian cricket team. It leaves a smile on my face. But when my eyes dart towards Gopumon, even my alter-ego starts shouting from inside my mouth with the words ,"How dare he?" Sreesanth might even have an hairstyle like Malinga, but can he bowl like him in one dayers? Only His attitude will determine that in the future. Dhoni did not take part in the post-match celebrations. He could not bear to see Sreesanth's emotional reactions after the match. Immediately he went ahead and Tonsured his head. BTW, Poonam Pandey's mobile phone is with me. Disagree with what you wrote about Sreesanth. Yes this was not his tournament But he is one of the Good pacers India possess right now. 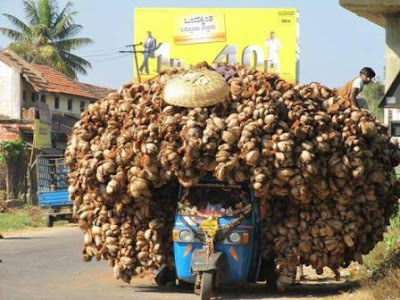 The malinga pic is cool. pathetic state of the national team to consider gopumon as one of the finest pacers in India now. Any way this is entirely a post on his attitude.. considering this worldcup, he was a total failure. i somehow speculate that the indian team keeps shreesanth around merely for his amusement quotient. the shree side/freak show is quite the eye catcher. still he should stick to being water boy. he could dance, bawl,be a drama queen, grow dreadlocks yada yada..on the sidelines. just keep him off the pitch. I agree that the stats was not with Sree this time (as do many times). I have also enjoyed the Sree jokes and made fun of him. But remember that he is the FIRST (I mean that) person who scripted an Indian test victory in South Africa. Until Sree took that 5-40 against SA in SA, India never ever tasted victory in tests in SA soil. I dont want to see him in ODI team, but he is an integral part of the Indian test squad. i agree with jess on the fact that he is a good test bowler.. yes.. his outswingers that leave the bat are a treat to watch.. But in one dayers, he tries the same ball against the opening batsmen and that too in the first powerplay and he often ends on the receiving end..
to become a one day bowler, one has to master the yorker like malinga.. only zaheer can pass the acid test for a one day pace bowler in India. What is your contribution to win this world cup? Why are you enjoying every moment of winning? You are enjoying because you are an INDIAN.Sreesanth also an indian,as well as a member of winning team,so he has every right to cheer the happiest moment of his life,what is your problem? who are you to complain about it ? So sorry chris .. couldnt get the humour this time around :-) Being smacked around the park isnt anything new to Indian bowlers .. every one has had a taste of it .. our Zaheer too ( rem 03 ?? ). Reliable sources say Gopumon & Poonam are together gonna do a strip tease.